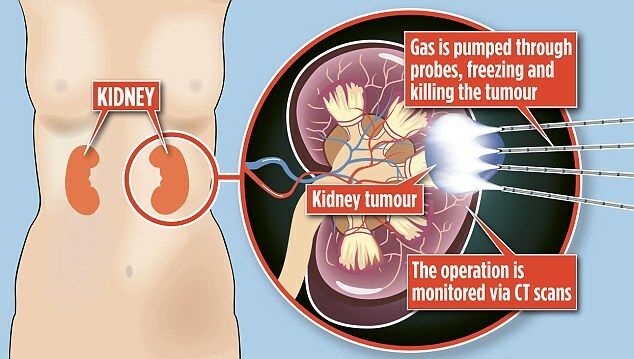 A remarkable procedure that uses freezing gas to destroy kidney cancers is offering hope to the 8,000 Britons diagnosed with the disease each year. The technique means no stitches, just an overnight hospital stay, and faster recovery times than traditional surgery. Kidney tumours are usually treated through open or keyhole surgery, with either the kidney, or a portion containing the tumour, removed. With cryoablation, however, there are no large incisions. Instead, extreme cold temperatures are used to effectively freeze, and therefore kill, the cancerous cells. During the procedure, a number of fine hollow needles are placed directly through a patient’s skin into the tumour tissue, through which argon gas is then passed. This freezes and then destroys the cancer. 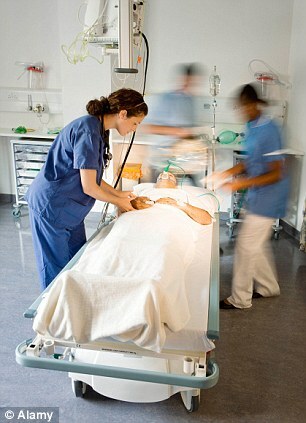 Patients usually leave hospital the next day and are able to return to work a week later. Other advantages include reduced risk of bleeding and infection, and limited damage to surrounding healthy kidney tissue. It is suitable for patients whose tumours are less than 2in in diameter or for those where surgery is considered too risky. Cryoablation can also be used to treat tumours of the bone and prostate. It is a technique within interventional radiology, which uses image-guidance – CT, ultrasound or MRI scans – in a similar way to X-rays, allowing doctors to view inside the body and target treatments. ‘The idea behind interventional radiology is to treat patients in the least invasive way possible,’ says Dr David Breen, consultant abdominal radiologist at the University Hospital of Southampton. Dr Breen performs the cryoablation procedure with patients under general anaesthetic. ‘Using the CT scanner to produce an image of the tumour, four or five probes are inserted,’ he says. ‘These needles are thinner than a pencil lead. Gas is passed through the probes, which makes the tips of the needles extremely cold – minus 150C. This generates ice around the probes to freeze and kill the tumour. ‘The process takes 30 minutes, during which we can see the ice growing on the CT scan and enveloping the tumour.’ Afterwards, the dead tissue withers away and is broken down over time. The procedure has negligible effects on kidney function. In January, Danielle Norman, 33, from Southampton, underwent the procedure, after being diagnosed with a cancerous kidney tumour. ‘The recovery time of six weeks associated with normal surgery wasn’t possible for me, as I have two children, Niamh, seven, and Aedan, two,’ says Danielle. Danielle underwent the procedure on January 24 and was back at home the next day. ‘I was a little sore but within a week it was as if nothing had happened.’ Danielle has a few tiny scars where the probes went in. Her follow-up scans show a good outcome. ‘At a scan in August, the doctors said they can see the tumour is shrinking, which is great,’ she says. ← The Story of Mets! How Does Kidney Cancer Spread?